The masquerades which flourished during the pre-colonial era [Before 1912] in Morocco are some of the truly interesting carnivalistic phenomena, among which is the jester, as it combines the merry spectacle with the sharp socio-political concerns. The masquerades have been taking place on two specific occasions : the Ashoura and the Eid Elkbir. It is indeed a phenomenon that bears much kinship to the embryonic phases that preceded the birth of the Greek tragedy as defined in the well known Aristotelian terms. In this article we will throw some light on the Bilmawen phenomen. This carnival emerges as a popular rite which takes place after the the slaughter of the Sacrificed Sheep in the morning of the Eid. Bilmawen has until very recently been one of the regularly celebrated annual festivals in cities like Fez, Marrakech, Tangier, and Agadir. Apparently the consecutive changes which our society has been subjected to gradually pushed this tradition aside so that nobody, except in the region of Agadir where it is still deeply rooted, really remembers what it was all about. The name given to this tradition differs from one region to another. It is called Boujloud in reference to the person who wears the sheep skin, like in Marrakech and its vicinities. In Haha and Doukala, the name Hairma is more frequently used. In Shyadma it is called Shouyikh as a shortening for Sheikh. In Tamazight (Berber), the person wearing skins is called Bilmawen, in Shaweya Hairma Bou Lbtayn. Boujloud is, however, the most commonly used name as it is unanimously assessed by the ethnographers like Doutte (1905-1909) ; Laoust (1921) and Westermarck (1935). All these names refer to the person who wears sheep or goat skin, paints his face with charcoal powder or puts on a mask as the case is in the Atlas region. Bilmawen may also wear bird feathers as the case is in the Rehamna region. In Haha and Mogador (Essaouira), Bilmawen puts on a pumpkin as a head cover and upon which are thrust hundreds of porcupine spines ; he also puts a rosary of big snail shells around his neck, and lets the sheep hooves which are attached to the sheep skin hang around his hands to enhance the bizarre look that he needs to have. The Bilmawen procession starts the second day of the Eid. Bilmawen, who can be one or many, is accompanied by the Ghayta flute players, drummers, and large crowds of people, who sing well known little songs which are supposed to describe Bilmawen as a scary creature, not welcome among the people. They may even throw little stones at him to chase him away. Bilmawen responds in jest, clowning and might, with his hooves, beat whomever he might catch, meanwhile talking an uncouth language which nobody minds under these merry circumstances. The other members of the procession mainly play music, dance and sing. 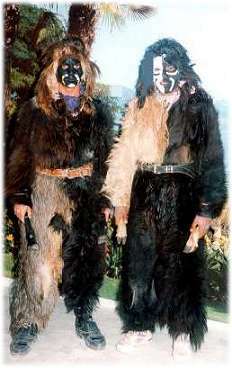 In the Warayne and Rehamna tribes, the Boujloud procession is distinguished by the participation of a unique and dominating figure, namely a man dressed as a woman in a heavily colorful non harmonious costume. Playing the role of Bilmawen's mistress, he or she too is subject to a great deal of harassment. This characteris usually notorious for unbeatable eloquence and indiscrete physical as well as verbal retaliations, so that the audience following the procession cannot enjoy any of the other parts of the demonstration better. The whole procession then reaches its destination, a public square in which a big tent is set. Sitting in front of the tent are women and their children. Bilmawen's mistress dances for the female crowd with her companions who are dressed as the Moroccan Jews. This part is habitually interrupted by Bilmawen himself who breaks into the crowd and runs after children to beat them. This act is commonly believed to be a Baraka. The procession then resumes its trip among the streets and the well-known public places of the tribe or the city. The most preferable places to visit for Bilmawen and all his companions are the houses of the elite and the rich. These houses, being open for the day, are an articulate welcome for the procession to go in and get gifts and money, which the participants share among them or save for the big public party that they organize on the last day of the festival. The Bilmawen celebration usually goes on for three days, but when the spectators are more enthusiastic about the festival, it can go on for a whole week. Laoust (1921) relates that the participating actors and musicians are chosen from the low social class youth-shepherds and outlaws or young people who find it easier to enjoy participating in the festival hiding behind masks. In Tafilalt, in the south of Morocco, the district officers are the agents who take care of procuring decent sheep skin for the participants. In other places, like Djebala, the main character who will be the year's Bilmawen is hired and paid. In the large cities, some people are known to be the caretakers of the Bilmawen tradition. They participate in the festival every year and when they grow of the age, they hand it down to their children. These people, famous for that part that they play in the Eid, are winners of a lot of sympathy and valuabe gifts which are given away by the rich. Wanting to share in the same privileges brings about a strong competition among the youth during the Eid. The mushrooming number of young people in sheep skin has taken away the spectacular and the meaningful aspect that the festival used to have. It has also affected the ritualistic feel that would attract people from all walks of life. Today, the Bilmawen ritual is reduced to a maskad pursuit of charity. t remains to inquire, as many researchers have, about the nature and the role which this special category of demonstrative celebrations play. Is it a result of the sociocultural need for artistic activities akin to theatre and all the other audio-visual means of entertainment? Or is the masquerade, as Westermark believes, a remnant of the pre-islamic rituals, which made the men of religion in Morocco believe that it is an immoral practice, or as they themselves call it the " foreign festival "? The parallelism between Bilmawen and the Ashoura goblin whose is executed by the people at the end of the festival. Doutte (1905) argues that in the Rehamna region, people symbolize the killing of Bilmawen by shooting rifles in the air, and swinging their swords in killing motions. Laoust (1921) believes that it is the tragic end of the creature in sheep skin. Later he dives in water as a symbolic act of purgation. The Amazighs of the Atlas believe that Bilmawen is a purgative power that relieves the sick of their aliments and/or the evil spirits. This healing power is in the hooves of the sacrificial animal and also in the sticks of olive and palm trees. These are the mediums via which the healing is transmitted from Bilmawen to the sick, because both have originated from two sacred living species. The last assumption, which stands opposite to the second, is that Bilmawen has no healing powers in his hooves and sticks. Rather he himself plays the role of a sacrificial animal which, after his death, relieves the people from their anomalies. Bilmawen's exotic aspect poses more than two questions about his nature and his purposes. We could also investigate his origins, his evolution in to the present tradition and its physical forms. As the case is for the time being, we can only resort to the foreign references with all their mistakes and misconceptions, until we ourselves get the chance to throw a closer look at our celebrational phenomena for the sake of more elaborate knowledge and better understanding.